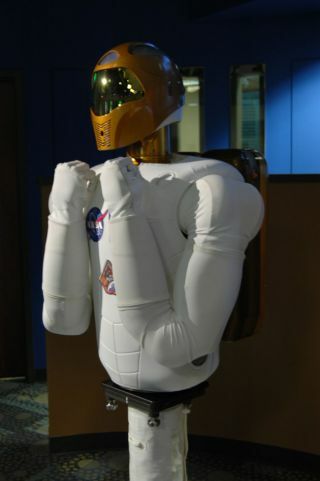 Robonaut 2, the first human-like robot designed for use in space, is ready for launch. A humanoid robot built by NASA and General Motors to be an astronaut assistant onboard the International Space Station will make a special guest appearance on the Fox Network's Super Bowl XLV pre-game show on Sunday (Feb. 6). The question is: will he be pulling for the Packers or the Steelers? The robot helper, named Robonaut 2 or R2 for short, will appear on Fox's pre-game show with sports analyst Howie Long during the network's festivities before kickoff. The show will begin at 2 p.m. ET on Sunday. Long was first introduced to R2 during a taped encounter Monday (Jan. 31) at the Classic Chevrolet dealership in Dallas, this year's host city for the Super Bowl matchup between Green Bay and Pittsburgh. But while Robonaut 2 resembles a human and features sophisticated control and sensor technologies so it can operate like one, don't expect R2 to rush, tackle or punt quite yet – the current prototype consists of only a head, torso, two arms and two five-fingered hands. The 300-pound dexterous robot traveled to Dallas from NASA's Johnson Space Center in Houston, where project managers are programming R2 with new skills that will eventually be uploaded to a twin version that is already packed up for its upcoming trip to the space station. A crane is used to lift the 330-pound Robonaut 2 out of its shipping container at NASA's Kennedy Space Center in Florida. The robot will be placed inside a different packing arrangement designed for the unique demands of launch and spaceflight. R2's twin has a ticket to ride aboard the space shuttle Discovery (albeit tucked away in a foam-padded stowage unit), which is set to launch on its final mission to the International Space Station on Feb. 24. After several months of delays owing to cracks on some of the support structures of the orbiter's external fuel tank, Discovery was rolled back to her seaside launch pad at NASA's Kennedy Space Center in Cape Canaveral, Fla. earlier this week. Robonaut 2 was developed by NASA in partnership with General Motors under a cooperative agreement to develop a robotic assistant that can work alongside humans, whether they are astronauts in space or workers at GM manufacturing plants here on Earth. Many of the technologies from R2 will also be used to help GM develop and manufacture safer cars. And while R2's mobility is currently limited, NASA is hoping that future enhancements and modifications will enable the robot to move freely around the station's interior, and perhaps one day, even allow it to venture outside the orbiting complex on spacewalks.